Did you run qmake PacketSender.pro in the src directory that contains PacketSender.pro? A second .pro file was recently added to this project, so make sure to specify PacketSender.pro. On Aug 29, 2018, at 5:31 PM, Dan Nagle ***@***. ***> wrote: Some things to try: Did you run qmake PacketSender.pro in the src directory that contains PacketSender.pro? A second .pro file was recently added to this project, so make sure to specify PacketSender.pro. Did the downloadable AppImage not work? (chmod a+x, then run it) — You are receiving this because you authored the thread. Reply to this email directly, view it on GitHub <#120 (comment)>, or mute the thread <https://github.com/notifications/unsubscribe-auth/AdyUQ9W_0YLrO6PE9ol2HordsrgR_Ireks5uVzJIgaJpZM4WSOPy>. Packet Sender does not require sudo. You should be able to chmod and run entirely in userland. You only need sudo to bind to ports lower than 1024, which Packet Sender does not attempt unless told. I’m seeing FSC errors with the generated packets. On Aug 30, 2018, at 7:07 PM, Dan Nagle ***@***. ***> wrote: Packet Sender does not require sudo. You should be able to chmod and run entirely in userland. You only need sudo to bind to ports lower than 1024, which Packet Sender does not attempt unless told. <https://user-images.githubusercontent.com/1140573/44888758-6425b780-ac98-11e8-99e7-474e50d60b54.png> — You are receiving this because you authored the thread. Reply to this email directly, view it on GitHub <#120 (comment)>, or mute the thread <https://github.com/notifications/unsubscribe-auth/AdyUQxfa6qKC_wTMvixiWGtNCsdZ7lx-ks5uWJpGgaJpZM4WSOPy>. Packet Sender operates at layer 4 (higher if using SSL) and lets your your OS assemble the actual packet. Is this when using TCP or UDP? Persistent or not? On Sep 7, 2018, at 12:35 PM, Dan Nagle ***@***. ***> wrote: Packet Sender operates at layer 4 (higher if using SSL) and lets your your OS assemble the actual packet. Is this when using TCP or UDP? Persistent or not? — You are receiving this because you authored the thread. Reply to this email directly, view it on GitHub <#120 (comment)>, or mute the thread <https://github.com/notifications/unsubscribe-auth/AdyUQ9dAxNu4-P7fJN3PKbhsGUS-vZYJks5uYsqIgaJpZM4WSOPy>. I actually have to do stuff to keep a TCP session alive. UDP is literally just send and forget inside the code. Only the receive handler is threaded. Does this phenomenon happen over other mediums, such as WiFi? On Sep 7, 2018, at 2:14 PM, Dan Nagle ***@***. ***> wrote: I actually have to do stuff to keep a TCP session alive. UDP is literally just send and forget inside the code. Only the receive handler is threaded. Does this phenomenon happen over other mediums, such as WiFi? — You are receiving this because you authored the thread. Reply to this email directly, view it on GitHub <#120 (comment)>, or mute the thread <https://github.com/notifications/unsubscribe-auth/AdyUQ8dU1VFAY_IHqJg5VEmqabmZfClEks5uYuHSgaJpZM4WSOPy>. Never tested with a 10G connection. I cannot imagine why it'd behave differently. Sorry, I don't have that kind of equipment to check. On Sep 7, 2018, at 5:27 PM, Dan Nagle ***@***. ***> wrote: Never tested with a 10G connection. I cannot imagine why it'd behave differently. Sorry, I don't have that kind of equipment to check. — You are receiving this because you authored the thread. Reply to this email directly, view it on GitHub <#120 (comment)>, or mute the thread <https://github.com/notifications/unsubscribe-auth/AdyUQyOVOrC5PumBMqykN4XvLa3zVKrNks5uYw8JgaJpZM4WSOPy>. 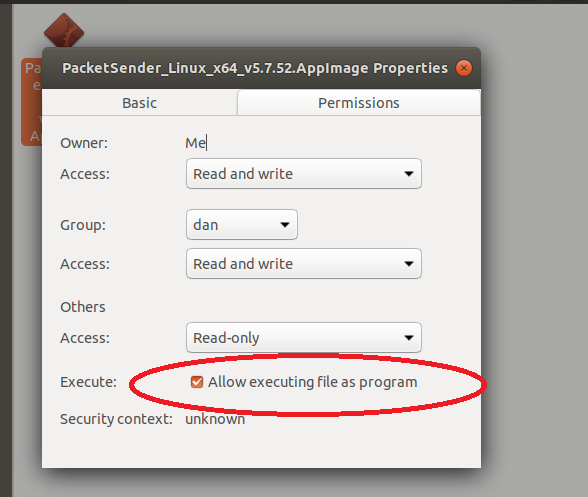 Linux Mint 18.2 PacketSender given executing permissions, same as the OneShot appimage which does run. PacketSender simply doesn't run when I double click or try in console. Any ideas? Just tested, and it runs on a fresh Linux Mint 19. I always compile and build the AppImage on the latest Ubuntu. Perhaps that is a bad strategy since this has happened before. I don't know what the problem is. The backup plan for Linux is compiling the source, and compiling Packet Sender is pretty easy if you are able to apt install the Qt SDK. Qt is Packet Sender's only dependency. Latest AppImage release is based on Ubuntu 16 LTS instead of Ubuntu 18. Should help these compatibility problems.